Black and White and Loved All Over: Tessa Jean's New Room! Moving Tessa out of the nursery where she's slept for two and a half years hasn't been easy. For her, it's been no big deal, but for me it's been emotional to move her across the house, further away from my ears and eyes and heart, which is connected to hers with a wire that's wrapped tight round and round and round. 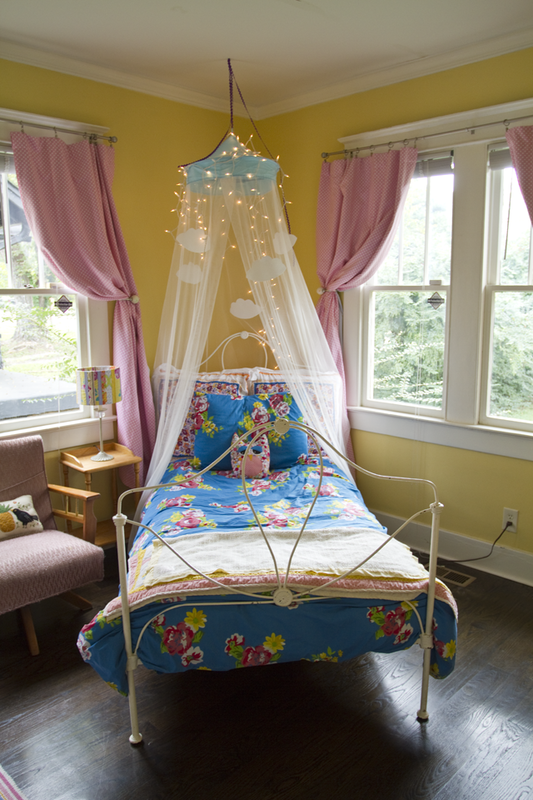 But it was actually her idea to give up her room for baby Livvy, and when we went over all the options it made the most sense. My mom kept Tessa on Saturday night, and on Sunday Nekos and I woke (after sleeping in) with a mission: Make a new space that would knock our little girl's socks off. 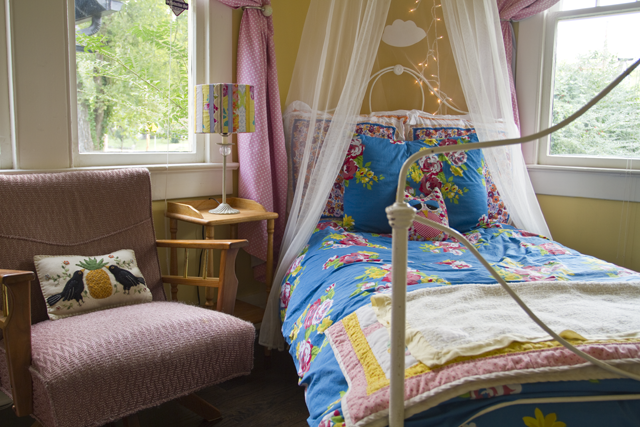 Here's what our guest room looked like before. We painted it in March before we knew we were expecting so decided to keep the color--Behr's Pismo Dunes--as it was. Other than her bedding, we didn't buy anything new. 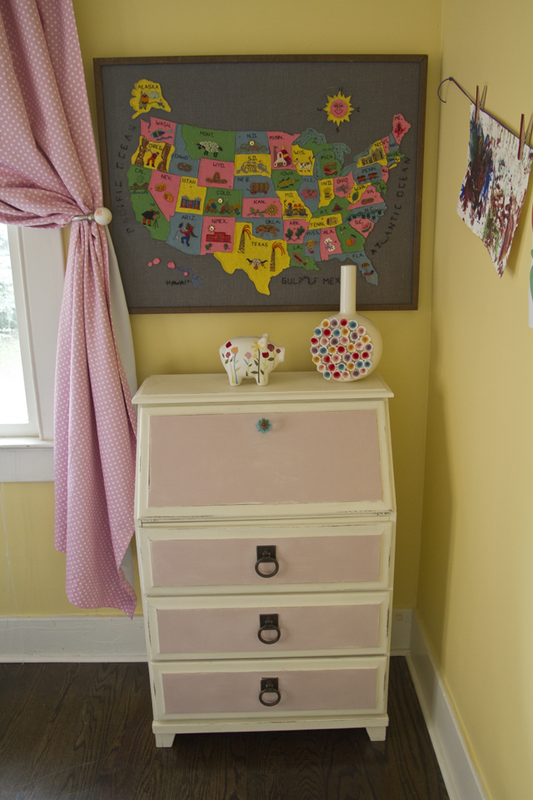 As I've blogged about, though, I did paint this old desk with Annie Sloan chalk paint, and used the same pink, "Antoinette" to accent her toy box, which I'd painted creamy white years ago. 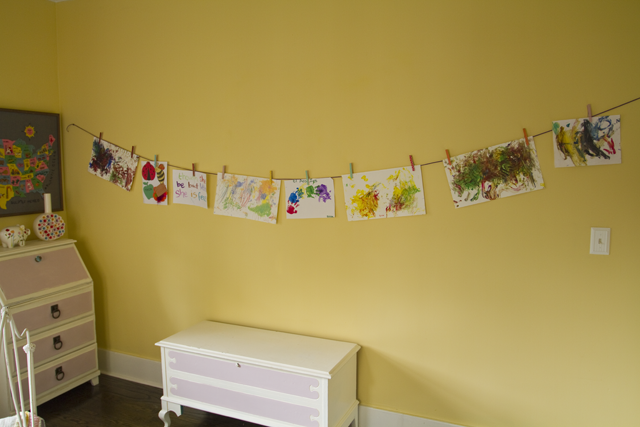 Plus we created a place to hang all of her art. She's very into painting so her work can be rotated out frequently. 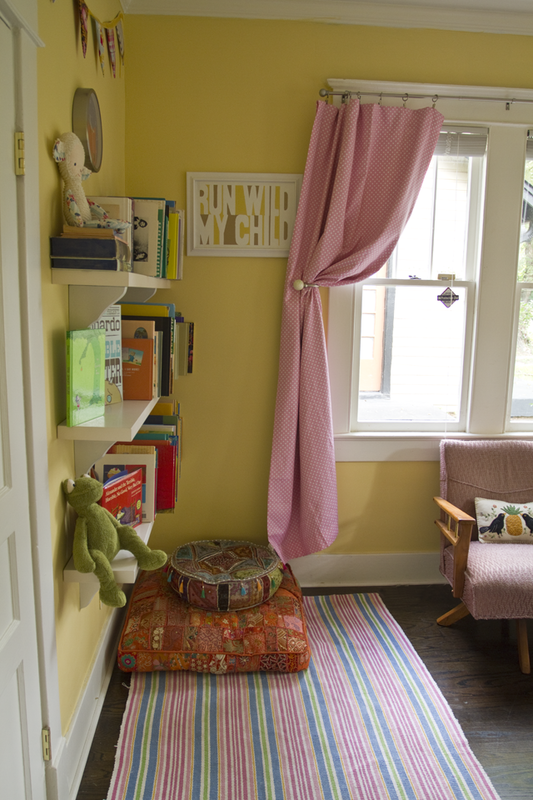 We drug these West Elm bookshelves up from the basement, cleaned them and set up a reading nook for our little bookworm. 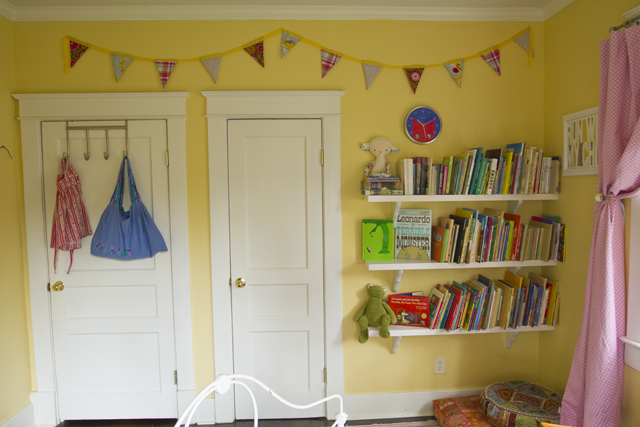 I made (and blogged about) this bunting a couple of years ago, and I'm so happy about how perfectly it matches the yellow-pink-blue color scheme of her new room. 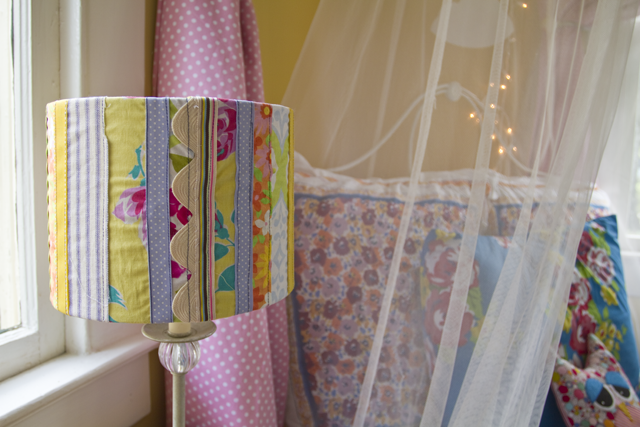 This ribbon lampshade, too, I made and blogged about a while ago. As for Tessa's reaction? I was anticipating it to be anti-climatic. (Remember when we told her she was going to have a baby sister?) But this little girl literally jumped up and down when she saw her new room, running around to examine every nook and cranny, even tripping and falling in her excitement. It was the best reaction we could have ever, ever hoped for. And that night, and every night thereafter, she slept like a baby big girl. Me? I may have had insomnia and hung on to the monitor like a lifeline. Absolutely love it!!! It's a Big Girls room! And it is was so beautifully created. It's absolutely perfect. Love every single bit of it. I love it!!! Can you come do my room?! 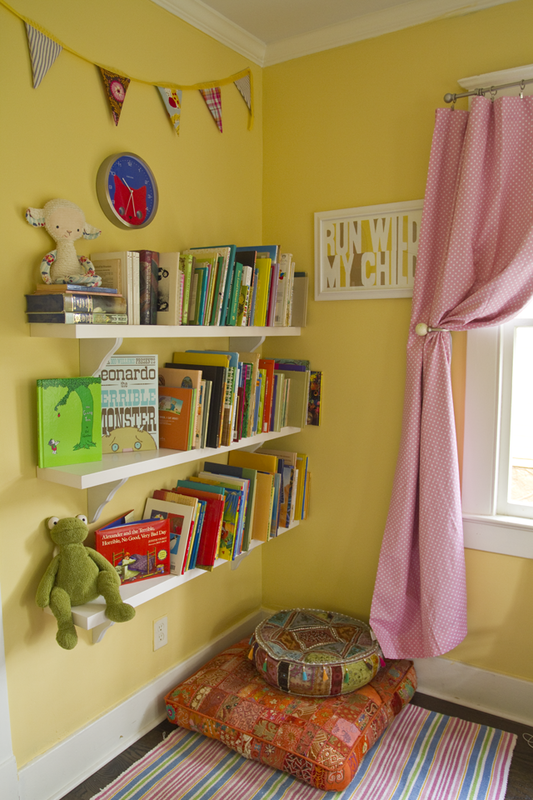 I cant wait to see the nursery! 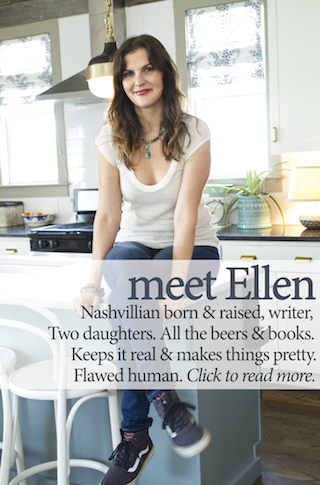 Ellen, it's beautiful. Would Tessa share her room with me? Haha. Thanks so much! Hope all is well with your little family! It looks so great! We are about to redo our 2 yr old's room to make room for baby too... I hope she is just as excited and transitions as easily as Tessa! Thanks, Lindsey! I hope you have an easy time with it, too. When are you due? it's perfect. just perfect. and how wonderful that she loves it and has been sleeping well in it. wonderful! !